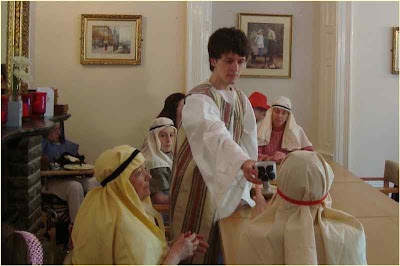 The actors playing Jesus and His followers, plus the Narrator and the musicians went into the nursing home where - in the dining room - Jesus and His disciples sat at the table and enacted the Last Supper. Several of the nursing home residents - many in wheelchairs - were brought in to see and to listen to the music (we played "I belong to the family of God" and "Break the bread and pour the wine". Outside a second narrator told the crowds what was happening as they looked in through the windows into the dining room. The Last Supper is one of Christianity's central and most important events - which we celebrate as Communion - and it was extremely moving to watch our young (18 year old) Jesus enact this event with such humility and meaning.